Google Adsense is undoubtedly the best PPC (Pay Per Click) Network in terms of Paying you the best revenue you deserves and Can be used in a blogger with No Traffic.But there are tons of people who are suffering to get Google Adsense Approval.They have a successful blog with more than 25k visitors per day and 90% of them comes from Google but still they are saying they didn’t got google adsense approved.Because Here Traffic doesn’t matters.So, that’s why today i came here with my 10 Best Google Adsense Alternatives of All Time.These alternatives are used by millions of bloggers and pro bloggers also use this on some of their blogs because sometimes we don’t get google adsense approved and trying again and again makes no sense. You can use any of the alternative to boost your earnings by blogging.You can generate more revenue if you are already using any other alternative along with this you can use Infolinks with any of the given Google Adsense Alternatives.That dosn’t matter if your site didn’t got Google Adsense you can not make money online.Even if your site doen’t comply with Google Adsense Terms and Conditions these Alternatives can make a revenue for you. 0.1 Can you Really Make Make Money From a Blog Without Google AdSense? 0.2 So what are the alternatives to Google AdSense? Can you Really Make Make Money From a Blog Without Google AdSense? The answer is Yes.You can make money from a blog without Google Adsense.As it is not impossible if you try to find some alternatives like in the post.Many alternatives provides PPC (Pay Per Click) and you can use it on your blog that will increase your blog earnings. So what are the alternatives to Google AdSense? You can’t say that you won’t earn if you don’t use Google Adsense on your blog or if you don’t get Approved.You can use Google Adsense Alternatives to make some revenue from your blog.Even if you are a part time blogger, you can make a revenue without Google Adsense Because There are 10 Best Google Adsense Alternatives that will help you earn some bucks or in fact earn money from your blog fro Lifetime, if you keep posting on your blog.So, here are The Top Ten Google Adsense Alternative that every blogger would like to use and even Pro Bloggers are using it on their blogs. Media.Net Probably the most popular Google Adsense Alternative and can be considered as the best first alternative because it provides various Features just like adsense do And it has been ranked the first AdSense alternative over any other alternative.My friends has tried it on their blog some months back when they didn’t got adsense approved and it worked like a charm and earn was also enough for them as they are part time bloggers.In fact we should not be a Full time blogger if we are not earning Much from a blog.But the point is it offers CPC (Cost Per Click) so this is also the best for many People as adsense does the same. Clicksor. Yet another Google Adsense Alternative.Provides features like you can choose your own type ads that are related to your Website/Blog and even if you get Google Adsense approved in future you can use this advertisement network along with Adsense.So, this is a plus point for this.It shows ads like Inline Text Links, Text banners, Graphical banners, Pop-unders and Interstitial.It even pays if you refer a customer to their network and you will be paid additional 10% for referring a Publisher or Advertiser to their network. Superlinks is another ad network that offers different styles of ads like Footer ads, Full Page ads, Exit links etc.The Plus point of using this ad network on your blog is you can even show upto 4 different kinds of ads on a single page.I liked this feature because adsense offers this feature only for premium users.So, this will help you make higher earnings than any other Adsense alternative. Bitvertiser pays you for valid clicks on ads place on your blog.It can even generate more revenue if you have added more ads against each other on your blog.You will be paud by Paypal as well as Check. Chitka is an online advertising network offers Cost Per Click.You can show ads on you blog or app or mobile site.It pays you for every revenue generated by CPC and allows you to display user search targeted ads, mobile type ads and local ads on your blogs or websites etc.The best thing is you will be paid if you refer a publisher to their program and can earn 10% of their CPC for 10 months. Lijit offers many ads like banner ads, rich homepage ads and social engagement ads for your blog and they says they deals directly with major Advertising networks so you will be paid more CPMs.So this is the sixth adsense alternative. Yillix is another ad network that offers all types of feautes like CPC, CPM, CPA etc and you can choose this network if you don’t find you type of feature in other Adsense Alternatives because this have many features.It pays better CPC because they have direct partnership with major advertising networks. I have experienced this network and it’s earnings depends upon CPC(Cost Per Click) and knows it pays very well to their publishers and you can choose this ad network as well as with any other adsense alternative mentioned above. Are you getting thousands of visitors to your blog? then this would do the best for you as it pays not for CPC but for pageviews per blog visitors are getting.If any one clicks anywhere on any of your blog a window of ads will popup and you will start generating revenue from this Adsense alternative.And alternative is Popads is InfinityAds. If you are good in reviewing other blogs or sites then this would be the best Adsense alternative for you.You can review other advertising networks and you will build backlinks and your traffic will also be increased and specially if you are blogging on blogger platform you can make much better money with this. 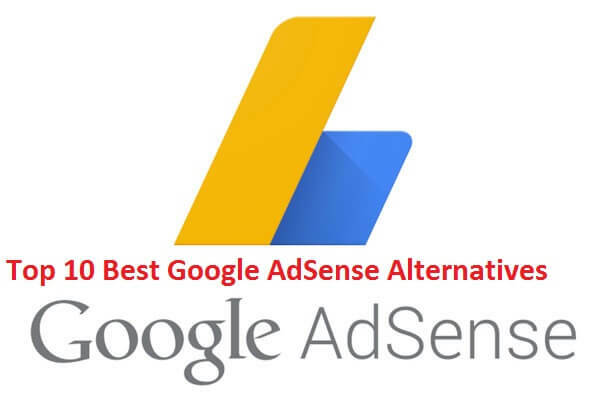 As these are the Top Ten Google Adsense Alternatives that pays to their users by different kinds of features.Though there are many other Google Adsense alternatives but we have provides the alternatives that we have tried some of them and feels it would be the best alternatives of 2015 and you can use any of the Above Google Adsense Alternative on your blog even if you got adsense now for your Blog.Soon we will be posting an article on “How To Approve Google Adsense” For your blog so stay connected with us on social sites or visit our blog daily so whenever it will be posted you will be able to know about it.